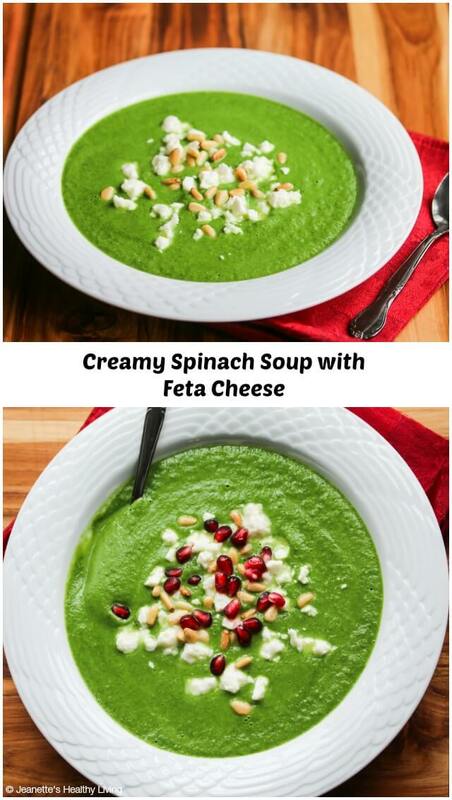 This Creamy Spinach Feta Soup with Pine Nuts takes the flavor of spinach pie and turns it into a bowl of comfort. Have you ever had Greek spinach pie? It’s one of my favorite indulgences when I visit our local Greek market. Sometimes the owner bakes spinach pies and sells them at the checkout counter. It’s so hard to resist when they’re displayed so nicely, hot out of the oven. 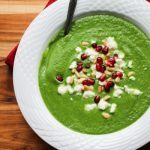 This soup recipe is a nod to the Greek spinach pie, with briny feta cheese on top, and lots of spinach goodness going on. For a festive touch, I sprinkled some pomegranate seeds. Last year, when I was at the Culinary Institute of America, one of the participating chefs suggested I try using raw pine nuts in my Creamy Cauliflower Soup to give it a creaminess without dairy. 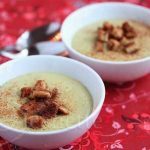 In this soup recipe, I use pine nuts two ways, blending some raw pine nuts into the soup for creaminess and sprinkling some toasted pine nuts on top for flavor and crunch. 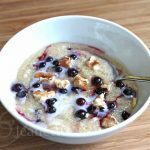 I lightened up the recipe and made it lighter and low carb, using cauliflower in place of potatoes and light cream. 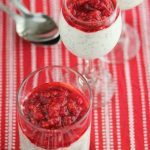 Cauliflower has a natural creaminess to it when pureed. 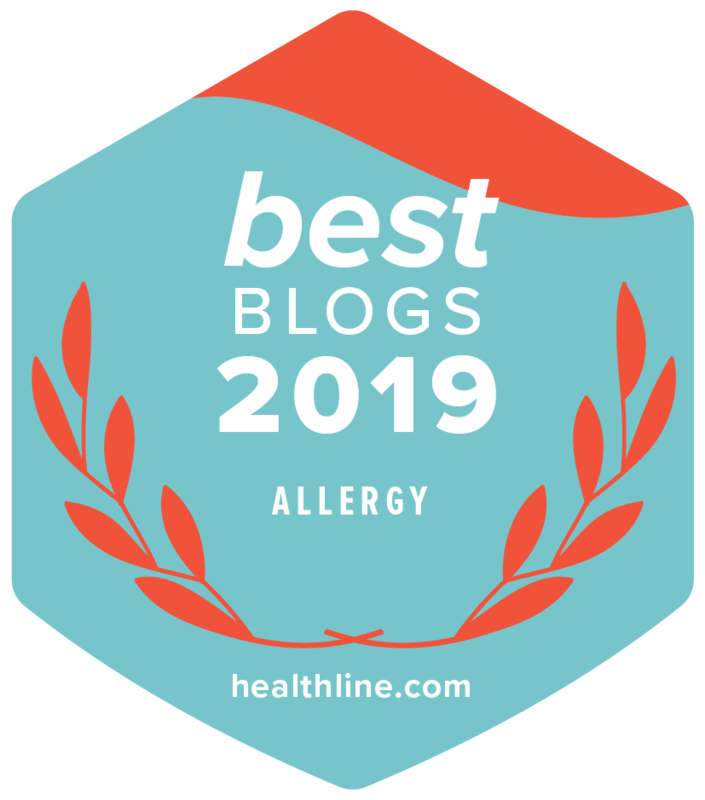 Earlier this year, I made a Skinny New England Clam Chowder for the Healthy Recipe Challenge on the Dr. Oz Show using cauliflower with great success. In a large pot, sauté garlic, onions and celery in olive oil until fragrant, about 4-5 minutes. Add wine, stock and cauliflower. Bring to a boil then reduce heat to low and cook, covered, until tender, about 25 minutes. Meanwhile, toast 3 tablespoons pine nuts in pan or in toaster oven at 325 degrees for 5-7 minutes; reserve. Add spinach to cauliflower and cook until just wilted, a few minutes. Place in blender with 3 tablespoons raw pine nuts and purée. You may need to do this in two more batches. 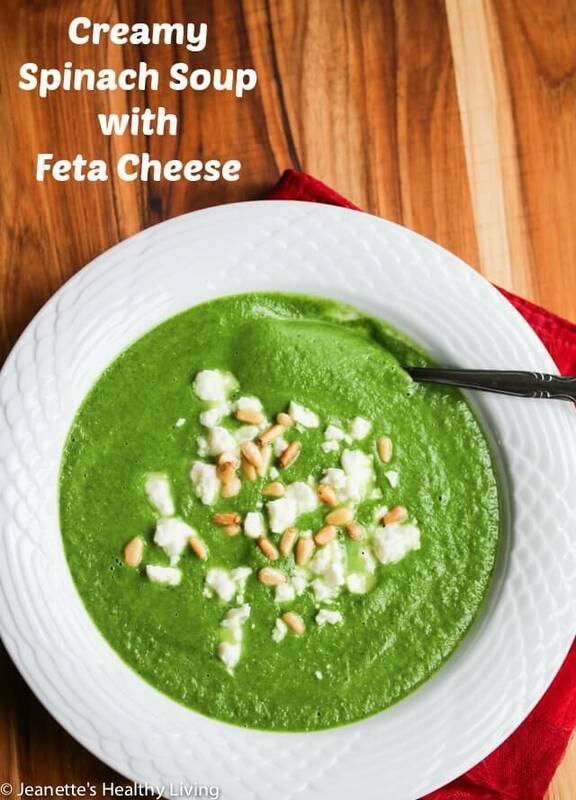 Pour into soup bowls and garnish with feta cheese and toasted pine nuts. 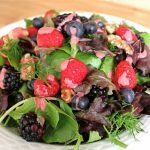 Sprinkle some pomegranate seeds on top for a festive look. Adapted from New England Soup Factory Cookbook. I love Spanakopita (Greek Spinach Pie) so the idea of using those flavors in soup sounds great to me. 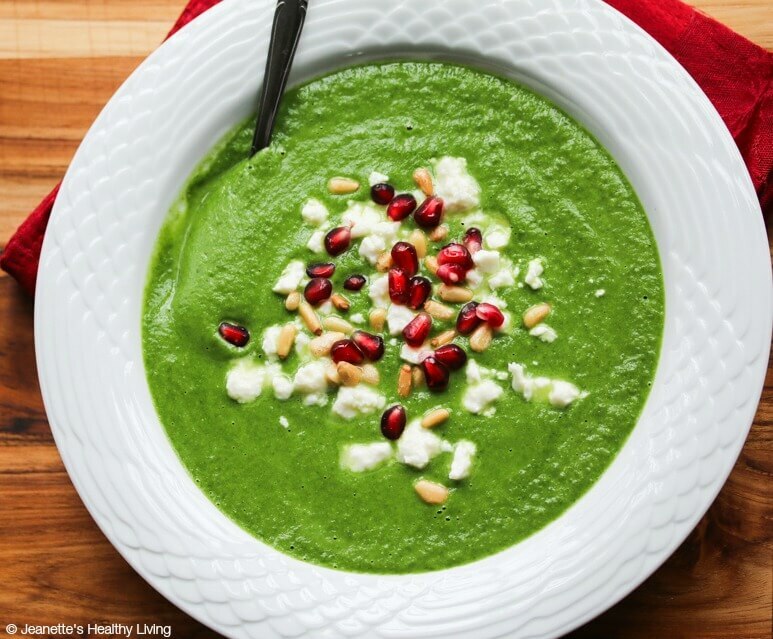 Spinach and feta are a nice combination – I love Greek food so this soup appealed to me soon as I saw it. I love a good Greek spinach pie, although I don’t have it too often. Your soup could definitely fill in as a replacement 🙂 Those colors!!! Can’t wait to try this! Loving your substitutions! 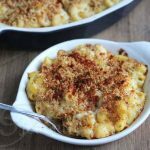 I’ve been incorporating cauliflower into various dishes for that exact same reason. I’ll have to experiment with adding pine nuts ;). Now where is my spoon? 😉 Wishing you and your family a Merry Christmas!! 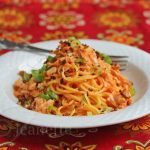 Min – cauliflower is a great low carb substitute as well as a good dairy-free substitute in recipe. Merry Christmas to you too! I adore Spanakopita and love that you made a healthy soup incorporating those flavors. The colors look incredible and so festive! Wishing you a very Merry Christmas and a wonderful Holiday Season with your family! Thanks Kelly! Merry Christmas to you and your family too! Your recipe looks and sounds wonderful. Definitely in my “to try” pile. What a unique way to blend those flavors. The color of that soup is gorgeous too! 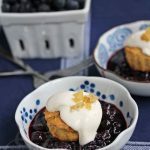 This is such a great idea – I also love the flavors of spinach pie! Thanks Alyssa! Hope you and your family have a wonderful holiday! Love having a low-carb version of Greek Spinach pie! Love gorgeous, Jeanette! Jeanette, love this soup! 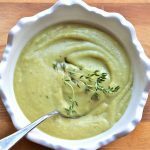 I’m definitely already thinking about ways to eat healthier in the new year and love the idea of using raw pine nuts to give soup a creaminess without dairy!! I’ve never done this before. . can’t wait to try this!! I love the creaminess of this soup, Jeanette! I enjoy Spanikopita so this soup must be delicious! 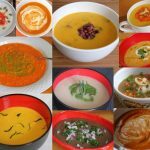 Thanks Cindy – creamy soups are always so comforting this time of year (and this one has no cream ;)). Hello! This recipe looks wonderful. Just curious how I can use dairy in place of the pine nuts in the recipe to make it creamy. Miriam, you can leave out the pine nuts and add a touch of cream if you like. Made this tonight…..it’s so good! It really does taste like spinach pie. And so healthy!!! Can’t wait to make again. Thank you!! Edith, thanks so much for trying this recipe – so glad you enjoyed it. 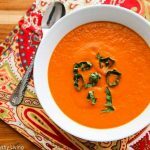 I love spinach pie so this soup was my way of getting my spinach pie fix with a healthier kick. I would like to add calories to this yummy looking soup. Making it for my sister who has cancer and needs extra calories. 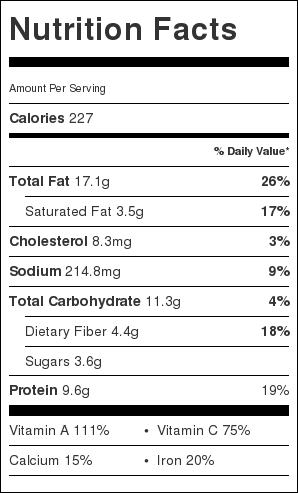 If using potatoes and light cream in place of cauliflower, what are the proper amounts?